It’s Friday and it’s time to talk books! 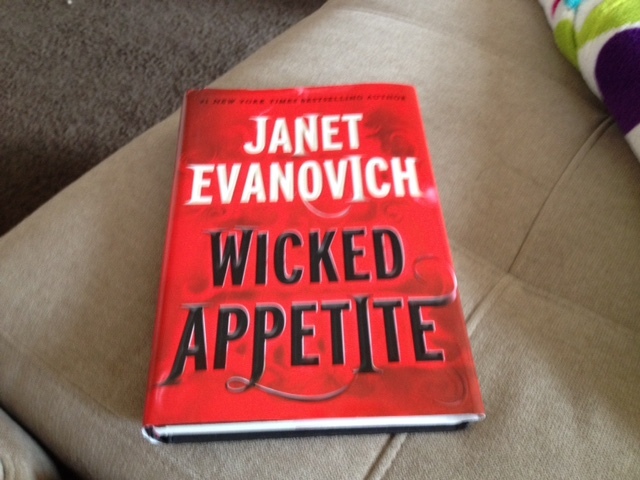 Last night I finished reading Wicked Appetite by Janet Evanovich, the first in the Lizzy and Diesel novel series. When I first saw the cover I wasn’t going to pick it up. It just didn’t look like a book I would read. But as I’ve said before, when a blurb grabs me I usually have to read that book. And boy am I glad I did! I’m not sure if there is one word I would use to describe this book. It’s a fantasy/witch/wizard/funny/culinary treat. Elizabeth Tucker, Lizzy as she’s known by friends and family, leaves NYC to live in her great aunt Ophelia’s house in Boston. Not happy with her life in NYC, the promise of a position as a pastry chef at Dazzle’s Bakery and a house of her own, propels her to start life anew. She’s finally pretty happy and in a nice groove in this new life – until a guy named Diesel enters her life. And with Diesel she finds herself a pet owner of a cat named Cat 7143 and a rude monkey named Carl. And that peaceful, mundane suburban life is anything but when she finds out that she has an unusual ability and Diesel has to partner with her. He’s not only too good looking for her own good, he’s stubborn and he’s determined to stick to her stickier than any sticky bun she could ever bake. This magical tale is sassy, laugh out loud funny (my family was giving me some odd looks) and truly a page turner. I read it in one day! If you’re looking for a fun read and an escape from your work week this weekend, I recommend you pick this one up. I don’t think you’ll be disappointed. And if you do read it, please come on back here and let me know in the comments. I’d love to hear what you thought of it. 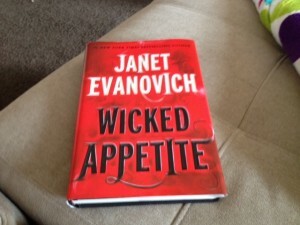 As I mentioned, Wicked Appetite is part of a 3 book series, so I already know what book I’ll be picking up next. When I like a series, I plow through ALL the books. On tap for this weekend: Wicked Business, another Lizzy and Diesel Novel.